My feet have been freezing lately. We’ve had snow already and a few cold days that have kept my feet ice cold. 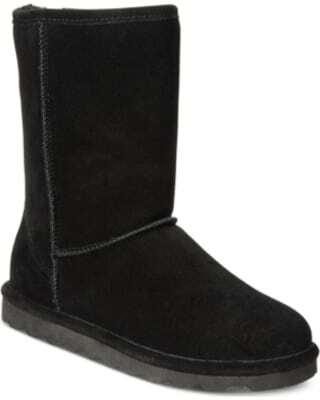 Enter the BearPaw Short Elle Boot. Warmth! You know what’s awesome about these boots? they can handle rain. Straight out of the NeverWet collection, the Elle is perfect for people like me who live in rainy climates but still want the comfort and warmth of shearling boots. 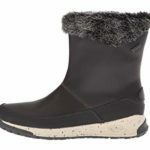 These would also be excellent for snow and slush. They come in eight different colors, including a shimmery taupe Pewter (pictured above). Personally, I’m loving the Chocolate brown, which is a deep, rich dark chocolate that offers versatility. They look so cute with leggings, skinny jeans, and skirts and dresses. 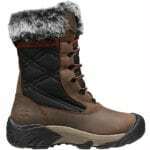 These boots are comfortable, cozy and true to size. I wear 9 and the 9’s fit perfectly. I love these so much, and I’ve been so cold lately that I’m starting to be open to the tall ones, which I always thought would be too hot for me. For some reason, my feet and legs have not been overheating one bit in these shorter boots, and I think it’s the natural wool which regulates body temperature. Meanwhile, this 8-inch tall boot is a happy medium that offers ever more versatility. They’re light and a great choice for winter travel. 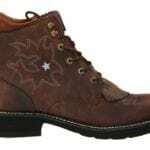 Find the fabulous BearPaw Short Elle Boot HERE.